The Pinquins in The Norwegian Church! 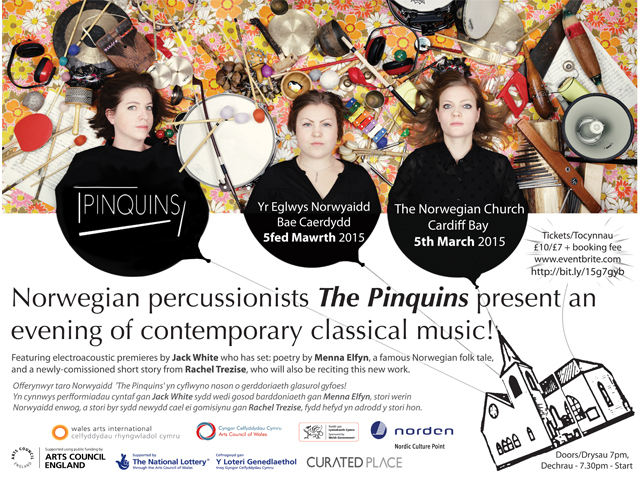 I am very excited to be able to start the publicity for my upcoming concert with The Pinquins! They will be performing in Manchester on the 3rd of March, and Cardiff on the 5th of March this year. I have been collaborating with the trio writing a piece for electroacoustics and percussion, inspired by the Norwegian folk tale ‘East of the Sun and West of the Moon’. I have also been collaborating with brilliant Welsh writer Rachel Trezise, using her newly-commissioned short story ‘Good Friday’ as the basis for a piece for solo vibraphone and electroacoustics. We are also lucky enough to have Rachel join us for the concert and recite her work. As well as these two pieces, there is a third premiere in the form of a piece inspired by Menna Elfyn’s beautiful poem ‘Cloc ar y dŵr’. The Pinquins will also be performing a selection of their favourite contemporary pieces for percussion – so make sure you get your ticket soon! http://bit.ly/15g7gyb Click on the link to be taken to the ticket-purchase website. Posted on 23/01/2015, in General and tagged 5th March 2015, Cardiff Bay, Curated Place, Folk tales, Jack White, Literature, Menna Elfyn, Percussion, Rachel Trezise, The Norwegian Church, The Pinquins, Trio. Bookmark the permalink. Leave a comment.